So I've been using a force sensing stick (like the F-16) for a while now. Is there any base the grip would fit on to (or be adapted to) with force sensing, or are there any plans to produce such a base in the (long?) future. The stick looks absolutely incredible, best in class, but having seen the benefits it would be difficult for me to give up a force sensing style of control. Thank you. If I understand you right, you're asking whether we're planning a base with tensometric sensors. No we are not, and same goes for more or less foreseeable future. Does anyone know if there will be excess stock of the VKB-Sim MCG PRO (3-pin Rev.B)? Or is there just enough for the pre-orders? It is supposedly going to be available April 30th. If you wanted the K-12 grip would you would have to order it seperate from the base? Also, is there, or will there be a full metal K-12 grip? and I would have bought a gunfighter from this batch if it was available with this grip for my right hand. Hello, I had a preorder on a Glad Mk1 pro compatible MCG Pro a many months ago(when it was first available), it was canceled due to uncertainty or whatever. I would like to know if there is any way to get an MCG pro for my Glad Mk1 pro or did VKB abandon the Mk1. Pro after using the feature of modular grips being available in the future in order to sell it? I feel that it is unfair that I backed and purchased from the company earlier than all these other people but am effectively punished by it, after buying the gladiator with the sole intention of getting a modern grip for it because of the base buttons for VR. I would like to know when a MCG pro option will be made available or I would like a crossship return of my Glad Mk1 Pro for a Gladiator Mk-whatever works with MCG pro and an MCG pro, and I will pay the difference. Thank you. There will be, as announced, MCG/MCGPro grips for GLMk1. I have several config files that I use for different games and to try out different things. Would it be possible to have the current cfg file in view, perhaps next to the device being used. shadepiece wrote: ...will there be a full metal K-12 grip? Is the new firmware coming out anytime soon for the gunfighter? TheAlchemist wrote: I have several config files that I use for different games and to try out different things. Would it be possible to have the current cfg file in view, perhaps next to the device being used. On page 18 of the manual, this is written if I understand your question correctly. 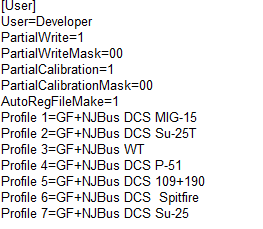 After performing these actions, when the profile is downloaded, the number and name will be displayed in the configurator accordingly. Here, for example, is a piece of my zconfig.ini. Works great. Hey, i have a question. I got the impression that the 4 way hat + push button on the thumb position is swappable with a standard pushbutton. Like a helicopter trimmbutton. In my package are just black replacement buttons and a black 4 way hat + push button. I already talked to Euduard but it seems i musinderstood the european shop which says: User-swappable thumb button on grip (4-way switch + push factory installed; standard push button available as an accessory). This sounds to me like you can change the 4-way switch + push with a standard push button on the thumb position. Sure you would lose the 4 way function of the 4 way switch + push but you would still have the push function. Like the trim button on a helicopter stick. This feature was one of the reasons i decided to buy the MCG Pro. It seems that Eduard has a lot to do and has not responded yet. Im sure he will but i wanted to ask you guys if i really misunderstood the meaning. The thing is, the pro package will be shipped and i really want that button replacement if it exists. I hate the Warthog 4 way hat + push button because sometimes it is difficult to push without acticvating one of the 4 way hat. So did anyone has a pushbutton which fits on the thumb postion? Ishtaru wrote: Sure you would lose the 4 way function of the 4 way switch + push but you would still have the push function. I hate the Warthog 4 way hat + push button because sometimes it is difficult to push without acticvating one of the 4 way hat. You can always leave the 4-way buttons not assigned to anything. So even if you accidentally also press one of those 4 when you push the hat switch, it would not matter. That is not my issue. The issue is that you can feel the click but it is not allways the push button. The question i have is if i just misunderstood the shop which says: "User-swappable thumb button on grip (4-way switch + push factory installed; standard push button available as an accessory)." Maybe it is a translation error because the US shop page says nothing about swappable buttons. I just want to be sure. Maybe it is just me who are to stupid to understand properly? It could be and i would like to know it. If i misunderstood i gonna make my own button. I like to fly helicopters and a swappable 4 way hat + push with a normal pushbutton would be awesome in my opinion. Thats why i was excited about this feature.